with your Original Recipe and Creator’s name printed. Signed, with a gold foiled seal by Raymond Foley, Publisher, ready to frame! We will only issue ONE Cocktailright® per recipe. Don’t give Up Your Rights, CocktailRight® It Now! 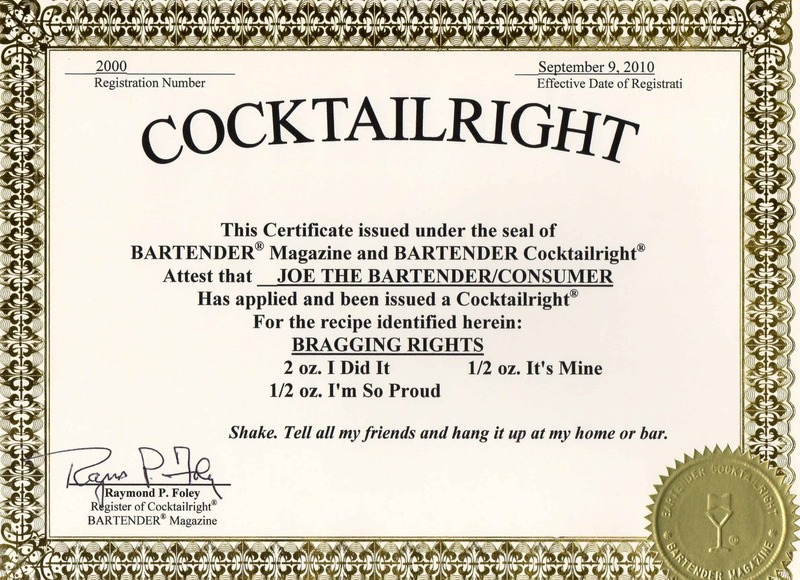 This certificate is available ONLY through BARTENDER Magazine. Only $30.00 for your CocktailRight® Recipe. This covers our cost of research, certificate, postage and handling. We will only issue ONE CocktailRight® per recipe. No copies will be issued. Please note: We respect your privacy. No information will be given out or used with an outside party, or used for solicitations without your permission. $30.00 for all orders sent to addresses within the United States. $40.00 for all orders outside of the USA (includes Canada, So. America & Other Countries).